With over 500 locations across the country and around the world, we’re going to guess that you have heard of Round Table Pizza. But Bend does not have a Round Table Pizza. Oh no, friends, Bend has a Round Table Clubhouse. Don’t worry die hard Round Table Pizza fanatics; you’ll still find the pizza, wings, and salad you love. But Round Table Clubhouse offers so much more. First, the restaurant itself has been completely remodeled and you’re going to love the modern, airy feeling. With that remodel came room for a pub area pouring your favorite craft brews on tap and in bottles, an arcade where kids of all ages can play games and redeem their tickets for great prizes, and party rooms outfitted with big screen tvs and lots of space for relaxing at your next special event. The restaurant isn’t the only thing that got an overhaul. The Round Table Clubhouse menu has some tasty new items you’re going to want to try. Specialty half pound burgers featuring Harris Ranch beef, sliders, gourmet sandwiches, onion rings, and fresh made potato chips just might give your regular pizza order a run for its money. 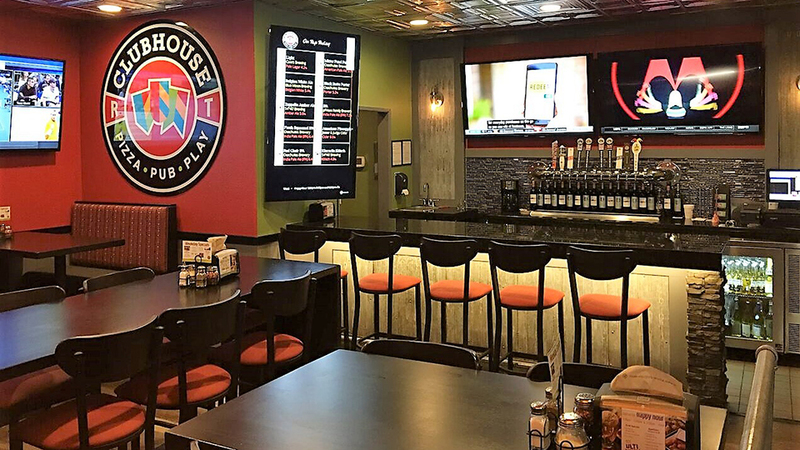 Bend’s Round Table Clubhouse is located on North Highway 97 across from the Riverhouse on the Deschutes, and is open daily from 11:00 a.m. – 11:00 p.m. Come on in and check out the Clubhouse difference.